Why is the Aquila column blue, instead of the gray of stone or the white of marble? Do you think the column was carved from a giant block of synthetic sapphire, to demonstrate the wealth of those who sponsored the construction of the Temple of the Emperor Ascendant? I didn't want to paint it grey or white. Yes, it's some kind of blue mineral found on Armageddon. I really like yellow plasma guns. They break colour scheme nicly. Also i like the sword in scabbard under the backpack. Yellow guns. Very third edition cover. 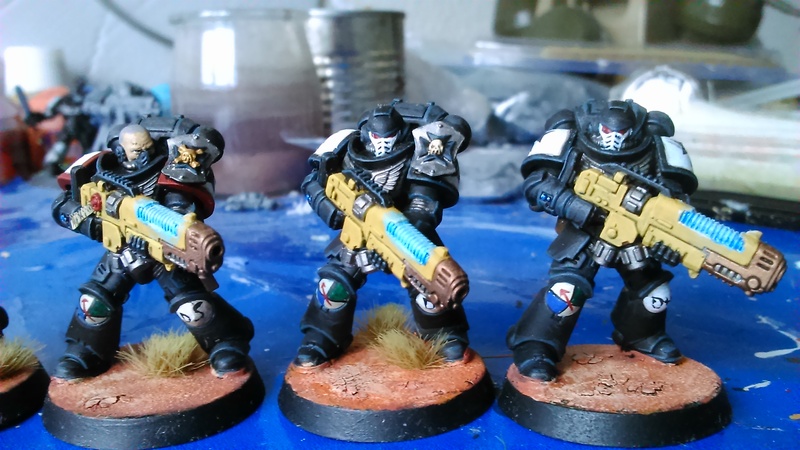 Intercessors and Lieutenant done ! 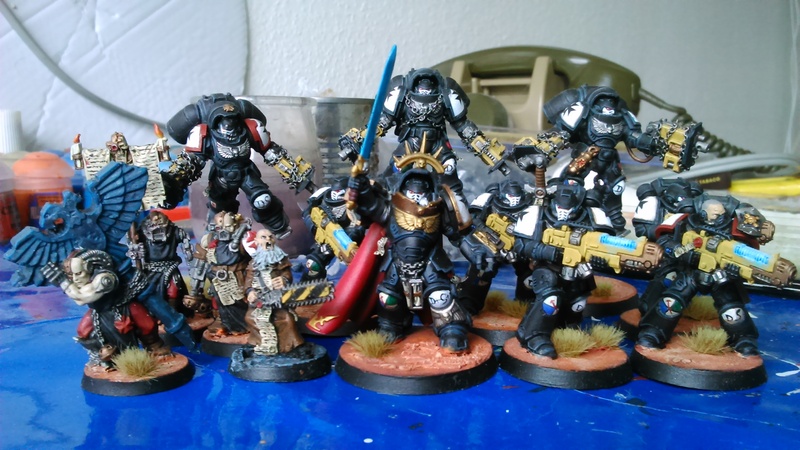 You made Guilliman's n00bs look like proper sons of Dorn. I shouldn't have doubted the fact an infusion of Sigismund's ZEALous spirit can fix anything. Excellent work. That acolyte with a chainsword is the best model ever. You can just see him standing in front of Ghazkull or Mortarion and just being like "Ya wot mate? 'Ave it!" I think it's more likely he'll shout, "Choke on this!" a split-second before the eviscerator is thrust into the traitors' throats. Nah look how far up he's looking. No way he could reach a throat. He's gonna give them a tickle on the knee. End their adventuring days. Those yellow guns really look good. 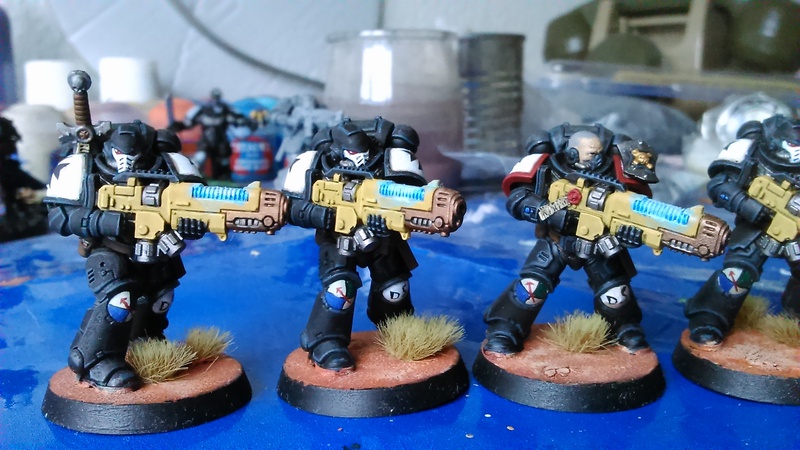 I also really enjoy the Mark III helmets on intercessors. Those red desert bases really light up the color scheme, very well done. Also very nice freehands indeed. 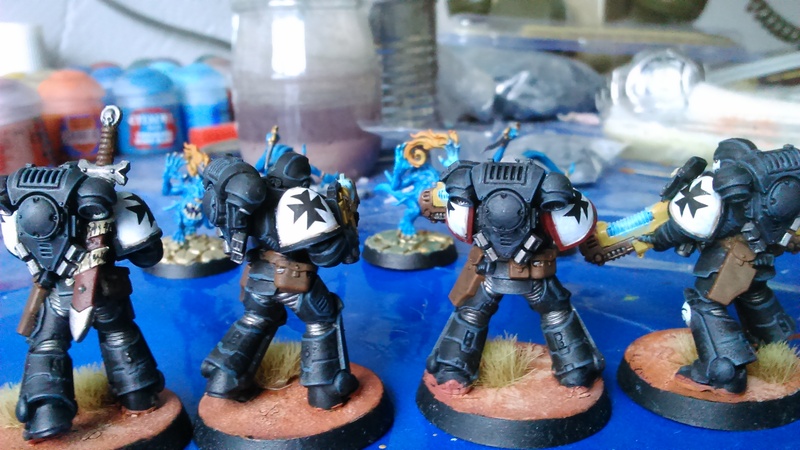 I'm not sure wether I would paint the knigth differently than Dorns Knights if I had one though. But it looks very good as it is, so cool, really nice crusade you got going there. There were my first try of free hand crosses. Personally I prefer to paint the knight in a different scheme to diversify. 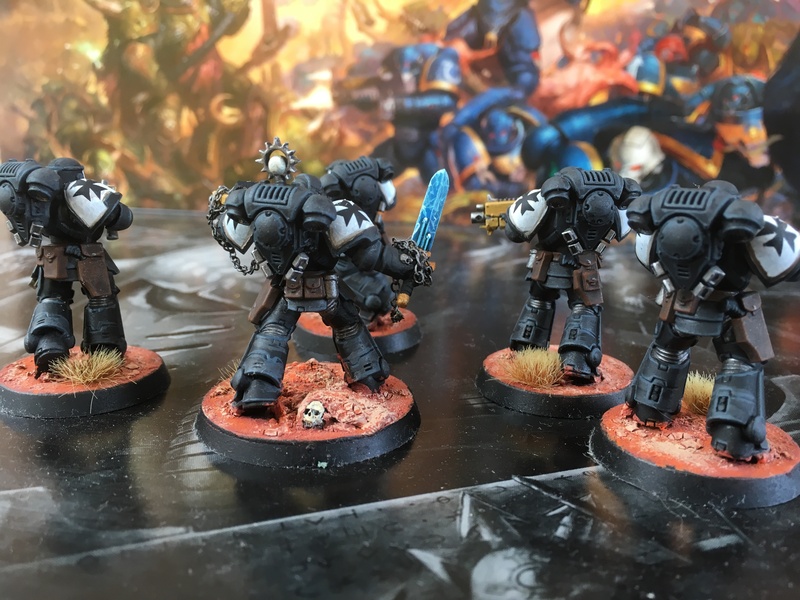 Terryn House can reroll charge rolls though so it's the perfect zealous complement to a Black Templars Force (Primaris are still shooty Marines for now). Yeah I can understand you wantiing a different colourscheme. I am still dreamkng of a knight crusader in templar colours or with heraldry that borrows from templars. Did you experiment with hazard striping on the weapons at all? I'm thinking about ding yellow + hazard stripes for my castellans teeth of terra. I did it on a priest with Eviscerator. Thats the picture I had on my mind as well. And it looks great on your priest. I think I will do more non-black guns in the future. I like the way yellow or red guns give some more variety to the army. 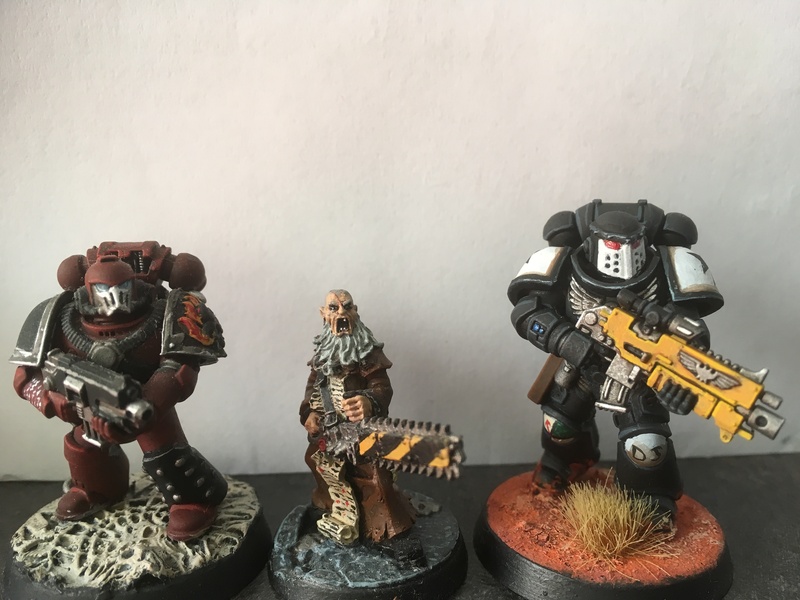 I have almost a complete painted playable army, only a squad of Intercessors, a repulsor and few special characters left to paint. The full unit of Neophyte. 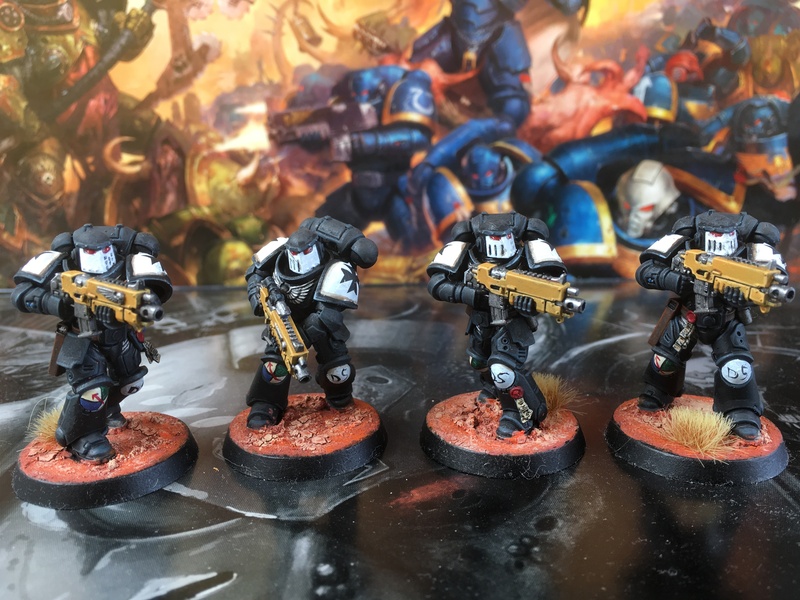 I didn't sell them because I hope some day we will have a Primaris crusader squad (Primaris need meat shields too). The Stormhawk Interceptor. I am not a huge fan of this model but I painted it for gameplay reasons. Last but not least, the Agressors. Lot of Dakka, I might test them this week end, to see if I expand their unit. The yellow weapon housings are a really nice touch. Edit... Nevermind! It worked after I posted! Edited by Canadian_F_H, 19 December 2018 - 06:21 PM. 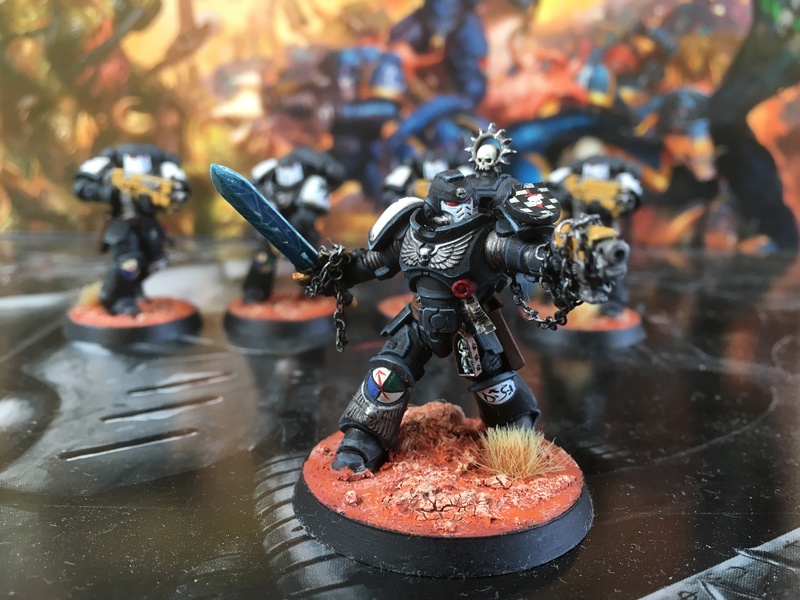 I will have another Look, when I add more primaris units to my crusade. How did you do your yellow?